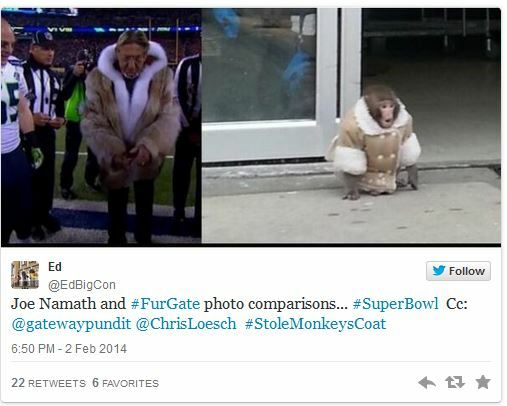 The first thing I thought when I saw Broadway Joe sporting that fine fur coat for the coin toss was, oh boy PETA is going to have a COW!!! Call the wambulance, PETA is upset again. 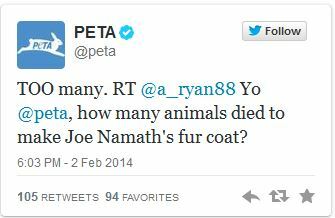 PETA took to twitter complaining about Broadway Joe’s fur coat he was wearing during the Super Bowl. Really folks, you don’t have more important issues to deal with. Like trying to figure out how to get folks to adopt pets rather than killing them. Broadway Joe looked the part. UPDATE I: Ha, looks like Joe was just imitating another, via re-tweet from Gateway Pundit.